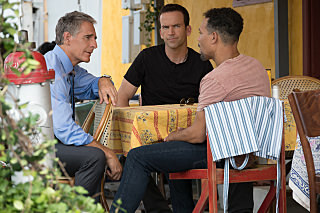 NCIS: New Orleans 5.08 - "Close to Home"
(Jason Alan Carvell) help to gain Mateo’s trust. hope they continue to work together like in the last episode. it was a good case and the team did great work, but pride was involved too much again for my liking. I am wondering why he took the new job when he is still working on every case with his team (and why are they calling him every time, anyway?) and how long he will keep it when he is never there. His assistant is doing a lot to cover all that. I don't like him very much (don't know why exactly), but he seems to be one of the good guys and he asked pride what I was thinking the whole time: "you have 50 special agents at your disposal to get it done. why do you have to be the one to save him personally?" it was nice to see pride's half brother again though. I agree with everything you said nuwanda. I also don't understand why he took the job, but is always working on the cases with the team. No idea Chelle. I don't get it. don't know that either. in my opinion it had worked well over the last three and a half years. don't know why they changed that last season. 2. gah seriously? Why can't LaSalle do things on his own without calling Pride? 3. I have nothing against it if he is around and if he helps the team it is okay too, but I want them to work together and not one person (who isn't even on the team anymore) to do all the work. Agreed about the students not thinking to look back when they didn't hear any more orders. I agree. LaSalle should be able to do things with out calling Pride all the time. It's like they can't think without Pride. Agreed that they should all work together and not just Pride doing it/taking over. Exactly. Its stupid though as we all know that they should be capable on their own - otherwise Pride hasn't done his job all this time very well. Yes its hard to have change, let go, & not turn to your former boss - but he shouldn't have to ask for help every 5 seconds. He was second in charge/the senior agent wasn't he? Shouldn't he know what he's doing if that's the case?